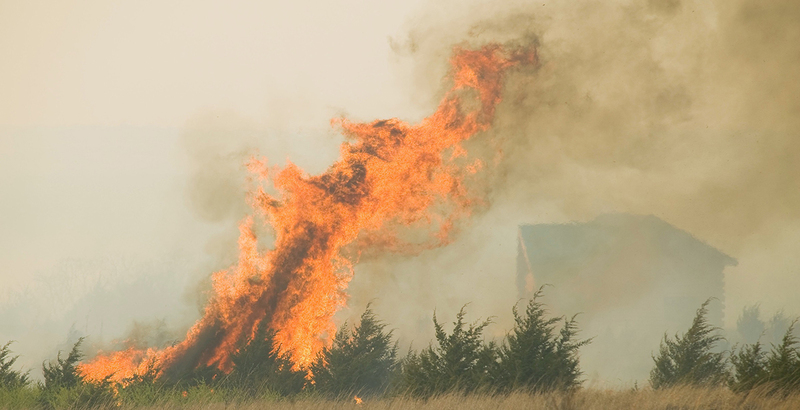 Operational for a dozen years, OK-FIRE is a weather-based, decision support system of the Oklahoma Mesonet and an extremely helpful tool for wildland fire managers throughout Oklahoma. J.D. Carlson, OK-FIRE program manager and fire meteorologist in Oklahoma State University’s Department of Biosystems and Agricultural Engineering, said the interactive website was redesigned last year and four training workshops will be offered this fall to help both old and new users learn more about the intricacies of the new site. Workshops will take place in Woodward, Oct. 18; McAlester, Nov. 14; Duncan, Dec. 6; and Stillwater, Dec. 13. All workshops will begin at 9:30 a.m. and end at 4:30 p.m., with an hour break for lunch. Traffic on the recently designed website has picked up as compared to past years. Carlson said April 2018 saw a marked increase in users, largely due to the Rhea and the 34 Complex wildfires in northwest Oklahoma that combined consumed about 350,000 acres. Because space is limited for these free workshops, only those who work directly (or indirectly) with wildfire and/or prescribed fire should attend. Workshops will be filled on a first registered, first served basis. Attendees will need to bring their own laptop computers or tablets. Registration is required and can be done online either here or by clicking the registration link in the announcement in the “News” section of the website. One also may contact Monica Mattox with the Oklahoma Climatological Survey by phone at 405-325-1788, or by email at mmattox@mesonet.org. Applications will be accepted up through the Friday before each workshop or until space is filled, whichever occurs sooner.